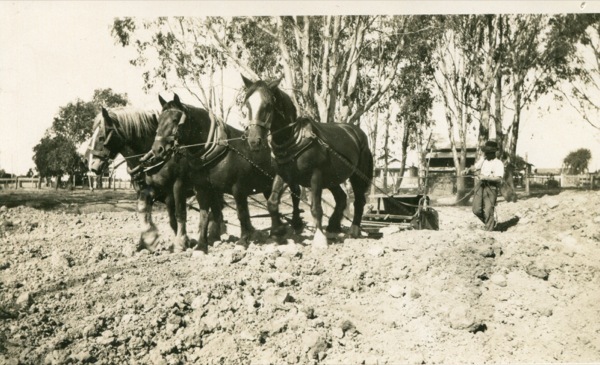 Practically nothing was done in continuing the work of the pioneers in town beautification until 15 years ago (c1919), when Mr. C. Palling was elected to the Shire Council. He made it a platform matter during the election fight to develop a swamp at the south-west of the town into a lake. His opponents belittled it. Unfortunately, Cr. Palling received no support from the council for his scheme, and it was dropped until six years ago (c1928) when a Progress Association advanced the matter. The Borough Council then took it in hand. A Parks and Gardens Committee was elected by the Borough Council, which, with the aid of citizens' movements had the following schemes carried out (Cr. Riordan being the chairman).-Lake and reserve: Swimming facilities, tennis courts, bowling and croquet greens. Playgrounds: Miller Reserve and Banner Paddock. Extensive tree planting in the streets; street paving by business people at their own expense. Swimming Club.-This club was formed about eight years ago at the instigation of Mr. A. T. B. Goyen, and held swimming sports on the Goulburn very successfully. 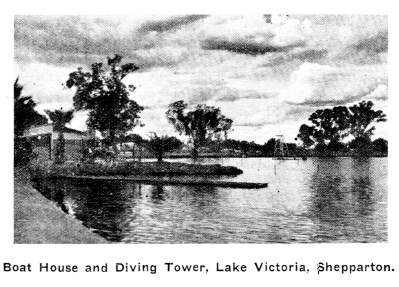 However, the fact that times of records were not acknowledged by the Victorian Swimming Association necessitated facilities being provided at the Lake Reserve, and the club held sports there for several years. The club has done much with the assistance of the Borough Council in providing the many up-to-date stands erected for swimming, including the diving tower and starting platforms. Each year since the lake has been made, the club has conducted carnivals with success. In 1933, the club got into financial difficulties and disbanded, and a new club called the Lake Swimming Club was formed, the secretary being Mr. Bob Jeffery. This new club paid off all liabilities of the old club and has since flourished. 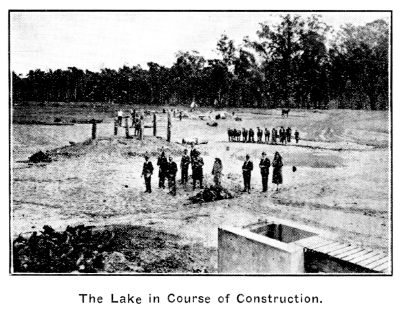 Construction work Shepp Lake 1929-30, Burgess Contractor. Many people talk about the day Buddha, Tony McGurgan, rode off the diving tower on his bike. This video is his story.